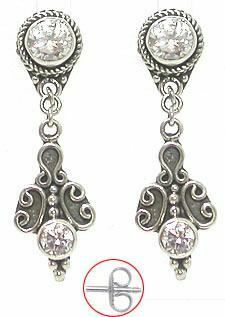 These Fleur de Bali Sterling Silver Fashion Earrings are hand crafted in Indonesia. These unique earrings have a crystal top jewel and a intricate sterling silver design and another crystal jewel off of a sterling silver dangle. Check out this matching Fleur de Bali Belly Button Ring.